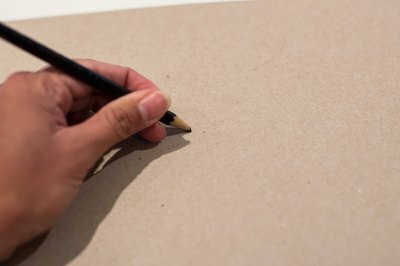 Cutting perfect holes in cardboard may sound a bit tricky, especially if your project involves cutting through layers of corrugated cardboard. Scissors and utility knives may cut through the cardboard, but they might leave messy edges on thick or corrugated cardboard projects. A compass-style circle cutter designed for cardboard and thin wood cuts perfect circles with precision in far less time than it would take to cut and clean up the cardboard with a utility knife or scissors. Cover the work surface with a sheet of scrap corrugated cardboard or a self-healing craft mat. This protects the work area in case you accidentally cut beyond the depth of the cardboard project piece. Set the piece of project cardboard atop the protected work surface. Determine the size or diameter of the hole you'd like in the cardboard. Adjust the mobile arm of the cutting tool to half the circle's diameter; for instance, set it at 1.5 inches for a circle 3 inches in diameter. 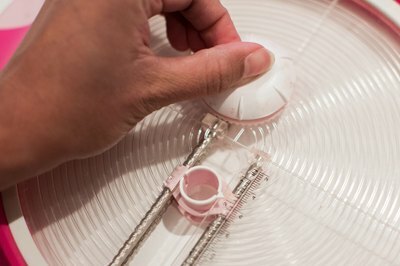 If your circle cutter does not display measurements, use a ruler to figure out the adjustments by setting the tip of the blade at the beginning of the ruler and adjusting the mobile arm to 1.5 inches or the desired measurement. Determine where you'd like the center of the circle's hole on the project cardboard. Draw a dot on the point with a pen or pencil. Set the pivot point of the circle cutter on the dot. The pivot point is the extended tip that points downward like the blade. Rotate the handle on the top of the cutter around in a circle, pressing downward until the blade has traveled in a complete circle. 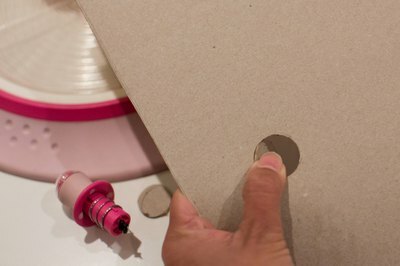 Pop the cardboard circle out of the project piece. Change the circle cutter's blade if it becomes dull. A dull blade requires extra force and may not cut a neat circle. Cutting through thick cardboard or corrugated cardboard takes a bit more force than cutting through thin cardstock. Press hard to ensure the blade goes all the way through the cardboard. 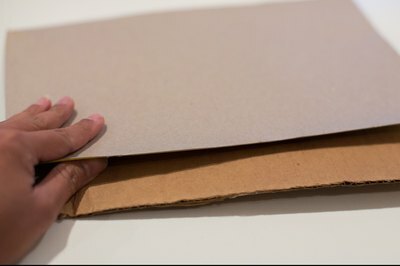 To cut straight-lined holes in cardboard, use a straightedge as a guideline and score the cardboard with a sharp craft knife or utility knife. Go over the scored lines several times with the knife until you've cut all the way through. Always cover the work surface with a protective pad or scrap corrugated cardboard to avoid accidental cut marks in the work area. Keep your fingers away from the cutting blade on the circle cutter to avoid injury.